Clearly I should not have picked the Jets to win this game (even though they were winning with just over a minute to play). Tim Tebow led yet another miracle comeback on the field of play last night and, for some reason, it still surprises people that he is able to win games despite the unorthodox﻿ option offense in which he plays...but not me. Anyone watching that final play could see clearly that something was wrong. It was as if the Jets were swept aside by some unseen force...well, ALMOST unseen. BEHOLD! GOD HIMSELF BLOCKED FOR TEBOW LAST NIGHT! WITH HIS GLORIOUS HAND HE SWEPT ASIDE THE ENTIRE DEFENSIVE AND O-LINES--PARTING THEM LIKE MOSES PARTED THE RED SEA--AND ALLOWED THE EXALTED ONE TO SCORE THE GAME WINNING TD, HALLELUJAH! You hear that, Moses!? 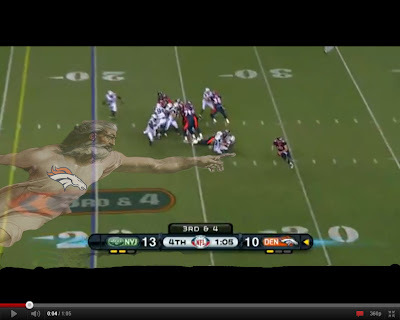 You led the Israelites to SAFETY...but Tebow led the Broncos to a TOUCHDOWN. He's got you beat by four points (five counting the extra kick).